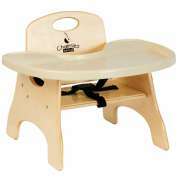 Highchairs & Feeding Tables: Shop From Our Great Selection! 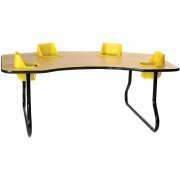 Make lunch and snack time a breeze with feeding tables from Hertz Furniture. Our feeding tables let little ones sit comfortably and securely, facilitating a calm atmosphere and encouraging proper eating habits. 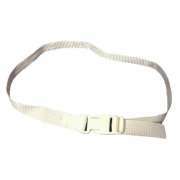 They are designed to make the day run smoothly for both toddlers and their caregivers. What kind of highchairs fit an early-childhood classroom? Our daycare highchairs are designed for constant use and take up very little space in your classroom. A choice of sizes allows you to fit babies, toddlers and young children comfortably. Having the right furniture in your preschool or daycare will make everyone&apos;s experience more pleasant and comfortable. During critical developmental stages, it is important for little ones to learn proper posture and positioning so they will remain healthy throughout their lives. It can be quite frustrating for young learners if they do not have daycare furniture that is properly-sized in their learning space. 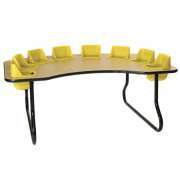 What kind of tables are good for lunchtime in a daycare? Toddlers are in an in-between stage where they are becoming increasingly independent, but still need considerable assistance. While you can certainly fill a daycare center with high-chairs for meal times, this option will quickly use up a lot of space and might make older children feel that they are being treated like babies. Alternatively, giving young toddlers separate chairs and preschool tables might not be a great idea either because they have not fully developed their balance and it might be difficult for them to reach the table surface, even if they have toddler-height chairs. With feeding tables from Toddler Tables, you can get the best of both worlds. 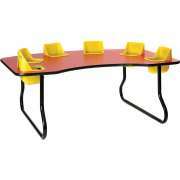 Toddlers will feel like the big kids as they sit around a classroom table, while the built-in seats guarantee that they can reach the surface. These tables aren&apos;t just for mealtimes. 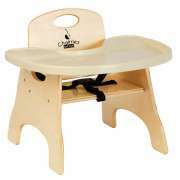 When little ones are working on a project, doing an early literacy developmen activity or eating snack, they will have full access to materials, when seated at these feeding tables .Features like high-quality laminate tabletops and removable polypropylene seats make our models convenient and surprisingly low-maintenance. Choose from a selection of sizes and colors. What is so great about toddler feeding tables? The unique arrangement of toddler feeding tables benefits everyone in the learning environment. Children can enjoy having a clear personal space while remaining in close enough proximity to peers to engage in natural social interactions. With all of the young learners seated around the outside edge of the table, a teacher or caregiver can easily sit across from them and facilitate a group activity. How safe are infant feeding tables? Anyone who works with little ones knows that safety must always be a main consideration. 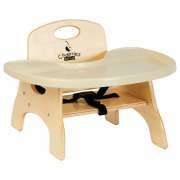 Infant feeding tables are designed to keep toddlers secure as they eat, play and interact. The built-in seats have individual safety straps which prevent children from squirming around and climbing out of their chairs. Unlike regular classroom chairs, built-in seats pose no danger of tipping. They help little ones sit properly so it is less likely that things will accidentally fall onto the floor. 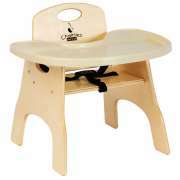 In addition to being safe and sturdy, our daycare feeding tables are also low-maintenance. Small children are always leaving traces of snack behind, no matter where or what they are eating. 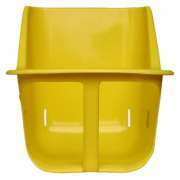 Feeding tables have polypropylene seats which are removable for easy cleaning. Their laminate tops are simple to wipe down as well. A choice of surface hues enables you to coordinate your feeding table with classroom colors. 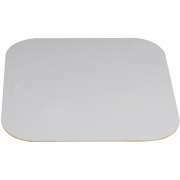 Table tops come in natural wood shades as well as vibrant colors. You can also choose how many seats you want at each table. Models are available with either four, six or eight seats so you can get the right number of spaces for the students in your classroom. What size high chairs are ideal for a daycare center? Not all high chairs can handle the constant use required in a childcare setting. That’s why you need to choose models that are designed for consistent feeding. Instead of getting full-size high chairs which dominate a space, lower high chairs allow little ones to eat comfortably without taking up too much room. With a choice of tray materials, they can fit a variety of budgets. Make sure to choose the height that best fits the children in your care as well. A good fit is important for developing proper posture and keeping little ones comfortable at meal times. Is it better to get metal or wood high chairs? The right material depends on what you are looking for. 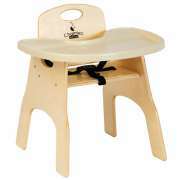 Plastic and metal high chairs tend to be more budget-friendly than the wooden options. However, wood does have a classy charm which may look nicer in certain places. A unique advantage of our plastic high chairs is that they are stackable, which makes a big difference in between meal times when you need the floor space for other things. Not everyone has a storage closet with lots of extra room, so stacking abilities should definitely be considered when making a choice about high chairs. Hertz Furniture&apos;s attractive and functional feeding tables are designed to help toddlers and their caregivers have the optimal classroom experience. 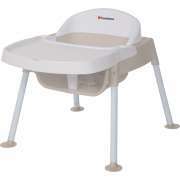 Whether you need a 4, 6 or 8 seat toddler feeding table, we&apos;ve got you covered. Feeding tables will make an excellent addition to any preschool or daycare. With the right classroom furniture, little ones will look forward to every school day.